FlexBon 162R/162 is a General Performance solvent-based product and can be used at higher application solids of between 45% and 50%. This is possible due to lower viscosity which in turn allows reduced solvent consumption. This results in overall reduction in the cost of laminate and makes it more environment friendly. The product also offers good wettability and solvent release during lamination; it offers good adhesion on all metallized and non-metallized films and is easy to handle. 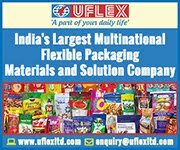 Owing to its great potential globally, the Chemicals Business of Uflex plans to target both domestic and international markets with this offering.